A teenage girl had been hired to babysit for a family in a neighbouring town.The family was wealthy and the house was large. She was to look after two young children whilst their parents went out to celebrate their anniversary. Before the parents left they gave the girl their mobile number in case of any emergencies. They also advised that she should keep the children out of their collection room, which they said was filled with various statues of importance to them. The parents left and the babysitter proceeded to give the children their supper. After letting them watch some cartoons she took them upstairs and put them to bed. She settled into the living room and began flicking through channels. After about half an hour she heard giggling coming from down the hall. Rolling her eyes she went to find the source of the noise, as she expected she found the children out of bed, playing. To her dismay they were playing in the collection room, which to her surprise was filled with statues of clowns. Like most people, she enjoyed the circus but this room was unnerving even for the biggest circus lover. Asking the children why they had gotten out of bed she scanned the room and shivered. The children laughed and pointed to a life sized clown sitting in a rocking chair. Her skin prickled. Walking over to the children she ushered them out of the room. As she walked, she felt as though the eyes of the clown were following her. Walking down the corridor she told the children that they are not supposed to be in that room. "We were playing with the clown, he's funny" they replied. She put them to bed and returned downstairs. She decided that it was best to inform the parents that the children had been playing in the collection room, just in case they had moved or broken something. She called the parents and told them that she had found the children playing with the life sized clown in the collection room. The voice on the other side of the line lowered, "What life sized clown? we don't have one". Confused she walked to the room and looked around the door, sure enough there was the clown watching the room from it's chair. "There is definitely a life sized clown sitting in the rocking chair" she replied. The mother's voice sounded panicked "Get the children and go to the neighbour's house NOW, we're calling the police and will meet you there". Immediately running upstairs she got the children and ran to the neighbour's house. A few minutes later a police car arrived and the policemen ran inside the family's house. Watching from the garden, she saw the police marching a clown down the path in handcuffs. When the parents returned they were told that a crazed prisoner had escaped jail a few days before with the intention of adding to his list of victims. They had found a large kitchen knife in his clothes. This one was always pretty creepy. Even though it didn't really make sense that a crazed person could be mistaken for a clown statue, it did skeeve me quite a bit. This isn't really a UL but I read it on creepy pasta--do you know the one about the guy in the woods who wanders into a cabin in the middle of the night where there are horrid pictures on the walls of really creepy creatures. But when he wakes up the next morning he sees only windows. Yeah, I get what you mean. I've been reading about Urban Legends for a few years now, and it's always appeared on the sites, which is the reason I included it. Plus I'm pretty afraid of clowns! the babysitter calls the parents and asks if she could place a blanket over the clown statue as she thought the clown was very spooky, but then the parents said.. what clown are you talking about? 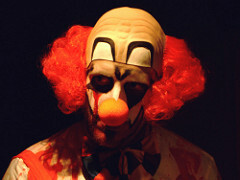 i feard clowns when i was little now you watch me killing them . This is freaky and now they're creating chain letters with this. I've also heard the one about the angel statue. It's just like this one.